Training to improve sustainable pace is one of the essential components for success as an endurance athlete. Understanding where your ‘threshold’ pace lies and conditioning your body to maintain this type of effort over a Sprint, Olympic or distance swim event up to 60 minutes is important. For longer endurance events +1 hour, then pacing slightly below threshold, at a tempo effort, is crucial if you want to finish the event or session at the same pace you started! It is very common to see athletes misinterpret their individual sustainable pace, and be puzzled as to why they experience a spectacular drop off in pace towards the end of an event or longer session. The key to success is sustainable pace training, to develop efficiency in technique and awareness of your ‘gears’ and judgement on how to improve, maintain or hold back a little on pace as required in order to produce the same splits at the end of a 2-3km session, as you did at the beginning. Open water/ lake – navigate accurately to and from swim buoys with sighting every 6 or 9 strokes. Engage a little more kick to maintain hips/ legs high in the water and lift only eyes from water before you turn to breathe in. Continuously exhale throughout! 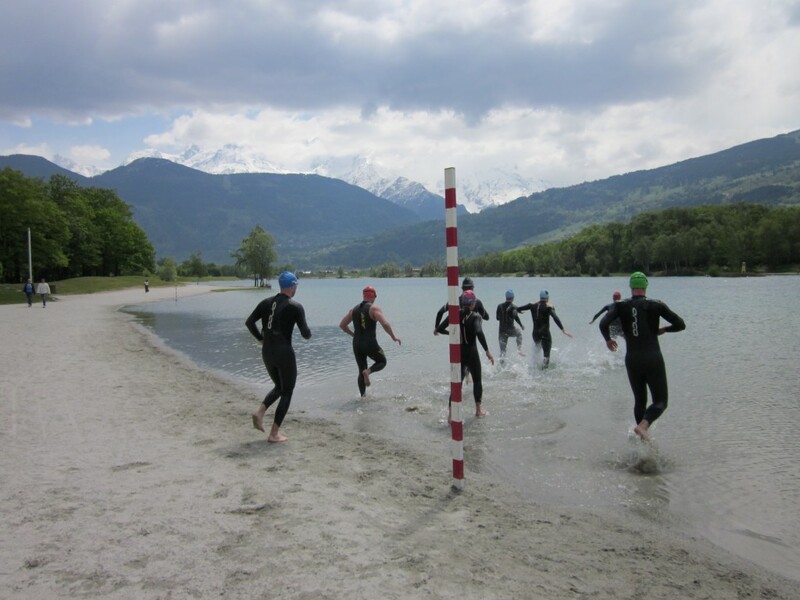 Open water/ lake – sprint away from each turn buoy, breathing 3/2/3/2 strokes. Navigate as required with regular sighting. Compare the data after the session. Note your initial splits compared to final and middle splits as well as the overall times for each effort. If there is significant discrepancy between initial and final splits on swim 1) or 2), showing a disproportionate drop off in pace then more pace awareness work is required to hold back and pace correctly (even if it feels too easy) at the beginning to utilise towards the end. Consider how the technique felt as you proceeded through the 1) fast and 2) tempo-threshold effort, efficiency gains can be made with endurance training to improve muscle memory. If you produced better splits and overall times on swim 2) then this is a key pace awareness exercise to take forward in terms of you being more efficient if not trying to over-pace or go for too much speed. Generally this will be true for most swimmers unless you are particularly one-paced. If you produced the same splits on swim 1) and 2) then you would likely benefit from lifting your sustainable pace by training accurately at threshold pace (CSS) to improve your overall speed. This is the type of swimmer who rarely goes out too hard and almost always stays within their limits (one-paced). Recognising the type of race specific training you need, particularly if it is pacing skills is an important component to include if you are working towards a Sprint, Olympic or distance swim such as an Ironman or 10k swim event. Enjoy putting this into practice this Summer!